In a previous article I described the propagation of the Rangoon Creeper vine by root division. 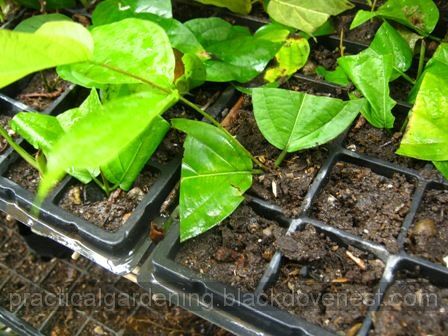 I also mentioned in that article how difficult it is to propagate the Rangoon Creeper vine or Quisqualis indica by stem cuttings. Well, I no longer think it's difficult. Apparently, you just need to know the right time and the correct techniques to successfully propagate it by cuttings. No matter how I tried, I was not successful getting cuttings to root in the dry season which is around March to May. I even tried misting the leaves every fifteen minutes - a rather ardous task if you do it manually. All the stem cuttings I had would drop their leaves from three days up to one week. This, by the way, is a sure sign that the stem cutting failed. I was, however, successful in getting the Rangoon Creeper cuttings to root in the rainy or wet season. Maybe it's because of the higher humidity in the rainy season. The first chart below shows the "rainiest" months showing the months with the number of rainy days. The second chart below shows the average humidty for the year. You will notice that the humidity is near the peak at the months July and August which happen to be the rainiest months. The Rangoon Creeper cutting was planted during the last week of July. After successfully rooting and growing new leaves, it was repotted in the last week of August. Select a mature yet still greenish branch. The cutting's stem should be around 2 to 3 inches long. The top part should have a node and a pair of leaves like the one below. Bury roughly 1 inch of the stem cutting in moist (not soggy) soil. The Rangoon Creeper has large leaves and so you may want to allot space for it. Cut the leaves in half to save space and avoid excessive water transpiration. I use seedling trays for cuttings. Position the stem cutting in partial shade or filtered light. I have my stem cuttings in seedling trays placed in the wall-mounted nursery racks I built. Mist the leaves of the Rangoon Creeper stem cutting around 2 to 3 times a day. Misting is spaced 4 to 6 hours apart. You could use a garden sprayer for misting. Sometimes, I just use my hand to sprinkle water around the leaves. It may take a while for the Rangoon Creeper stem cutting to root. If both leaves drop, then discard the stem cutting and plant another. There's virtually no chance for a leafless stem to root. A successful cutting may root in a month or so. A new shoot would grow from the node and new leaves will sprout from the shoot. If the old pair of leaves start to blacken, then cut the black parts with a pair of scissors. In the photo above, new shoots and leaves and sprouted while the old leaves have blackened. The old leaves were cut to remove the black parts. After a month or so, you'll notice roots at the base of the stem cutting. After picking the seedling plug from the garden tray, you'll see a network of tiny roots. Repot the seedling plug from the garden tray into a seedling bag or pot. Notice the two new pairs of leaves on the rooted stem cutting. You're welcome, and thanx for dropping by. had you used growth rooting powder ? what kind of soil or fertilisers should I use for cuttings? No, I don't use rooting powder. I only use ordinary soil mixed with coco dust (which we have plenty here), maybe compost, and just a little aged cow manure. I don't use other fertilizers for cuttings. Will this plant grow as a ground cover? Must it have something to grow up on? Ground cover - no. Something to grow on - yes. In fact, it needs something very strong (fence, trellis) to grow on. thanks! I'm in central Texas. We're a week short of October. Hi James. Thanx and welcome! I believe the success of the stem cuttings is due to the humid and rainy months (see chart). I'm in the Philippines by the way, so I don't know how it is in your area. The easiest way to propagate for us though is through root division or suckers. The link to do that is in the article. But of course you need to have a mature plant for that. Hi Madturk69. I'm in the Philippines, above the equator and in the Northern Hemisphere. Hi I am in Dominican Republic. I have an adult plant that my neighbor gave me when it was tiny. We at the nursery had been trying to propagate it from cuttings but never succeeded. Needless to say that I am so grateful to have found your tips and will try them immediately!!!! Thanks and many blessings!! Thanx Mati. If you have a robust mature plant growing in a container, the easiest way for me is to propagate by root division. Good luck! Good luck Indisa and thanx for dropping by. Thank you for the excellent clear guide! I'm in Brunei so the climate is similar to the Philippines, and it will be just the right time now as it is approaching the end of July. Also, I wonder if there is a way to get the long spurs to start growing form the bushes, or if that just what happens as they get mature. I've got three small 2 foot bushes, and one has just started putting out long climbing spurs. Thanx Dominic. Yes, I'm guessing the climate is similar. The spurs, as you call them, would be ready only with a mature vine. Good luck. Thank you Blackdove. I'll send an update later with my results for cuttings and sucker splitting. May Quisqualis indica be delyivered in April whithout any green part? It seeems a dead tree. Hello Maria. Not sure what you mean by that. If you mean can the cutting root in April without leaves? It may, but it will be difficult, in my experience.